This privately-run 3-star hotel in Hamburg’s lively Wandsbek district is a 20-minute S-Bahn ride from Hamburg Airport and a 10-minute underground ride from the city centre. 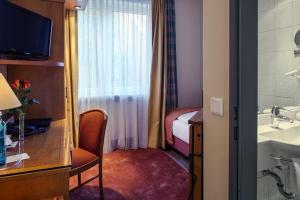 It offers bright rooms with free Wi-Fi. 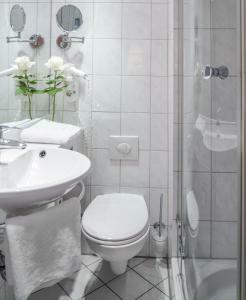 Satellite TV, a minibar and a private bathroom with hairdryer are included in every room at the Hotel Tiefenthal. Each one is decorated in warm colours. A large breakfast buffet is available each morning in the breakfast room, which features views of Wandsbeker Marktplatz square. Many restaurants and cafés can be found in the modern Quarree shopping centre beside the hotel. The Tiefenthal is located directly at the Wandsbek Markt Underground Station and Central Bus Station. 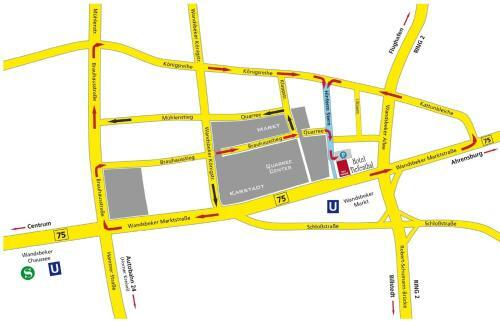 It is a 10-minute walk from Wandsbeker Chausee S-Bahn Station.They connect you to Hamburg Central Station and the Musical Theatre. The car park is located at the back of the hotel. It can be accessed via the road Hinterm Stern. When you arrive, ring the bell at the barrier and wait for the hotel staff to speak via loudspeaker.